We just hit 75,000 registered users! 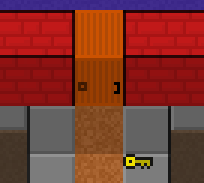 Also, the keys & doors update is now live: There are now three different key/door pairs, and keys generated are unique to each city. You can give/trade players keys or have them autospawn. Use them to give only specific people in a city access to a building, or to make dungeons more interesting! I have added one to the first dungeon, the Law Offices of LOL & LOL. Secondly, I don’t suppose you could limit each player to one of each key of a certain town? Otherwise it could clog up the inventory pretty quickly. Finally (for now), I’ve found, having a key block, I can place it in another person’s town, and it gives me a key to their town. Assuming they actually work, that would allow any player with plat to get through any key doors in a town they’re a cit of. Possibly limiting it to only officials being able to place key blocks would fix this, because if you’ve made someone an official, you probably trust them to open doors. And the mayor, obviously. Just an idea. Ooh, just found a bug. Just standing in the middle of my own town, with only a sword equipped, I have a ‘ghost’ of my inventory. I mean, when I hover the mouse over where the keys would be, if I had my inventory open, the ‘key to ‘ message pops up. Works on all 3 keys I have (2 of my own towns and 1 I was testing to see if I could get a key to Electro). I also tried respawning and refreshing the page, still happens. Even when the keys rearranged themselves within my inventory after refreshing, the message popped up at their new locations, before I’d even opened the inventory. Not entirely sure if that’s relevant, but it probably means it isn’t related to the Phantom Door Bug, for example. Quarterly Dev Update » « Visit us at PAX!